Music history tells us that the French conductor Paul Paray (1886-1979) gave more first performances of Florent Schmitt’s compositions than any other director. But perhaps an even bigger contribution to the musical legacy of Florent Schmitt was Paul Paray’s advocacy for what is arguably the composer’s most famous creation, the ballet La Tragédie de Salomé. 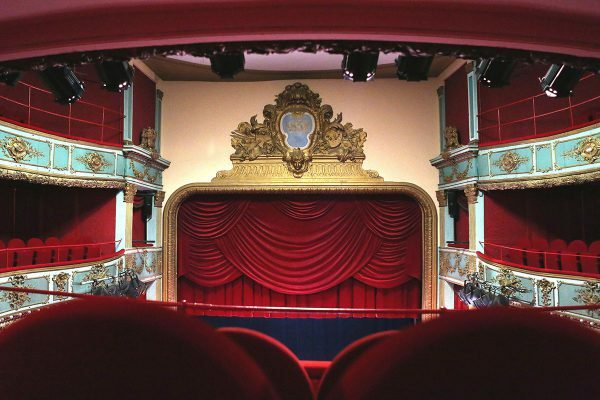 The interior of the Théâtre des Arts (now named Théâtre Hebertot), where Schmitt’s ballet was first mounted in 1907. Composed in 1907 as a nearly hour-long “mimed drama,” the production featured Loïe Fuller, an American-born dancer famous for her scarves and lighting effects, portraying Salome in a series of seven tableaux. Presented at the intimate Théâtre des Arts in Paris, the performance space necessitated utilizing a small orchestral ensemble of only around 20 musicians, with the proceedings directed by a then-very-young Désiré-Émilie Inghelbrecht. Several years later Schmitt revised Salomé, cutting its length by half while substantially augmenting the orchestration in the best post-Rimsky tradition — in the process creating one of the finest “orientalist” scores ever penned. 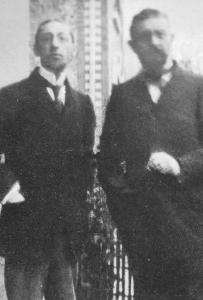 Igor Stravinsky and Florent Schmitt, photographed in about 1910. The new version, which Schmitt dedicated to Igor Stravinsky, was premiered as an orchestral suite in 1911 by composer-conductor Gabriel Pierné, even as it continued to be presented as a stage work featuring such famed prima ballerinas as Natalia (Natasha) Trouhanova (1912), Tamara Karsavina (1913) and Ida Rubinstein (1919). Paul Paray, who was Schmitt’s junior by 16 years, was likewise a recipient of the Prix de Rome first prize for composition (Schmitt won in 1900 for his cantata Sémiramis … Paray in 1911 for his cantata Yanitza). Beginning in the late ‘teens, Paray migrated into orchestral conducting, although he would continue to compose until the late 1930s; among his compositions are several very fine symphonies. La Tragédie de Salomé was one of the scores that Paray began conducting in the 1920s, and it was a work he would keep in his repertoire throughout his extraordinarily long career. 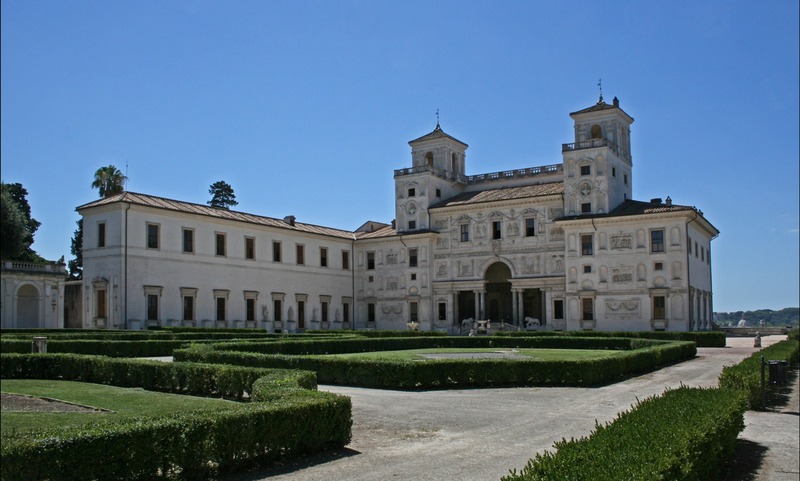 Early on, Paray directed the leading French orchestras in performing Salome, including the Concerts Colonne (where he was the orchestra’s music director) as well as the Concerts Lamoureux. But it was in the post-World War II period when Paul Paray’s championing of Salomé would arguably have its greatest impact. 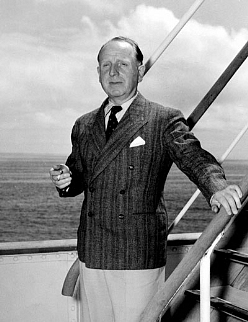 When the maestro came to America in the early 1950s to join the newly reorganized Detroit Symphony Orchestra as music director, he brought varied French repertoire with him that immediately began appearing on DSO concert programs – not only the “usual” works by Debussy and Ravel but also compositions by Chausson, Franck, Saint-Saens, Lalo, Roussel and others. Florent Schmitt’s La Tragédie de Salomé was one of these pieces. It didn’t take long for Paray to become recognized throughout the United States for his nonpareil interpretations of the French repertoire, due in part to an extraordinary set of recordings he made with the Detroit Symphony for the Mercury Living Presence label beginning in 1952. Mercury was one of the most enterprising classical record labels active at the time; its recordings were brilliant, and the sonics along with Paray’s artistic interpretations were nearly universally praised by critics. A common description of Paray’s approach to French repertoire was this: While other conductors treated the music like an oil painting, Paray treated it like a watercolor. Paul Paray takes Florent Schmitt’s La Tragédie de Salomé on the road: Pittsburgh Symphony concerts (1952). It’s an apt analogy – and it helps explain why Paray’s recorded legacy on Mercury continues to be prized by music collectors so many decades after the pieces were recorded. Importantly, Paray took his beloved French repertoire on tour as well – with the DSO and also in his guest-conducting appearances spanning the country from New York City to San Francisco. No Paray concert program was complete without containing at least one French work. La Tragédie de Salomé appeared on Paray’s programs – very likely for the first time in the United States since the pre-war days of Dmitri Mitropoulos in New York and Désiré Defauw in Chicago during the 1940s. 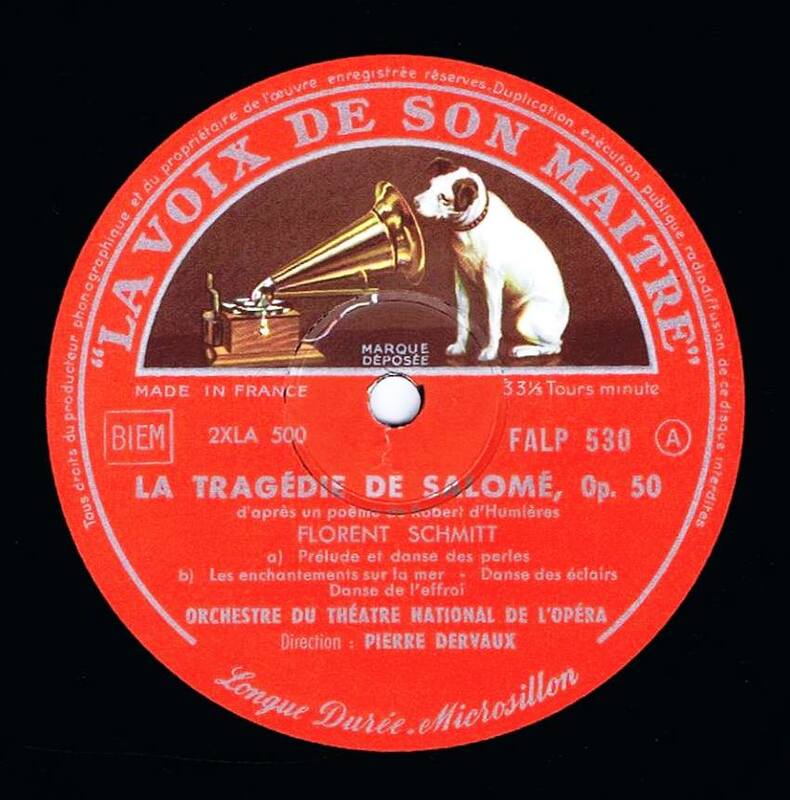 The 1958 Mercury recording of Florent Schmit’s La Tragédie de Salomé (U.S. release). In March 1958, Paul Paray and the Detroit Symphony Orchestra made the first stereophonic recording of Schmitt’s ballet for the Mercury Living Presence label. 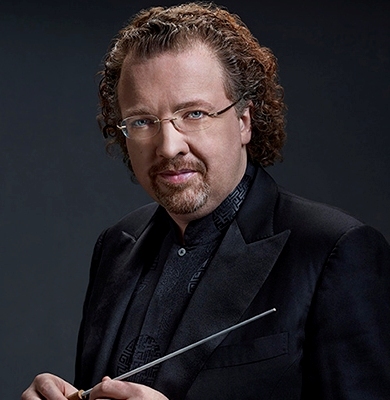 At this point, the DSO had been “his” orchestra for six years, and the precision ensemble exhibited on the recording surely demonstrates it. Nearly contemporaneously, Schmitt’s composition had been recorded in Paris the year before by EMI’s French subsidiary Pathé-Marconi – a performance led by conductor Pierre Dervaux that was made in the presence of the 87-year-old composer. The Mercury recording came to market in fall 1958; thus Paray was able to visit an ailing Schmitt at his home in St-Cloud to personally present the new recording to him. It turned out to be the last time the two musicians would meet, as the composer passed away just a few weeks later. The 1957 EMI recording, made in the presence of the composer. The Dervaux and Paray recordings were the first ones made of La Tragédie de Salomé in the LP era, but the Dervaux performance wasn’t recorded in stereo, nor was it ever released internationally. As a result, the EMI recording is not widely known, although it was uploaded to YouTube recently on Philippe Louis’ fine music channel and can be heard here. By contrast, the Mercury recording was given distribution all over the world – not only in North America but also in European releases (France, England, Germany and elsewhere), as well as in South America and Japan. The recording was well-received by aficionados of French classical music, not only for Paray’s vital interpretation but also for the polished orchestral ensemble and the audiophile sound quality. In 1960, it received the prestigious Grand Prix du Disque award – one of two such prizes awarded to Paray recordings among the nearly 60 that he made with the Mercury label between 1952 and 1962. The recording has been uploaded to YouTube and can be heard here. Back in print: The CD reissue from the early 1990s. For a period of time in the 1970s and 1980s the Paray recording was unavailable. But it was re-released in the early 1990s and has remained in print ever since. It continues to win critical accolades – including on a 2017 Radio-France program where it was judged the best of six well-known recordings of Salomé (the other contenders being the recordings by Sylvain Cambreling, Thierry Fischer, Jean Martinon, Marek Janowski and Yan-Pascal Tortelier). Paul Paray would continue to program La Tragédie de Salomé long after retiring from his music directorship in Detroit. 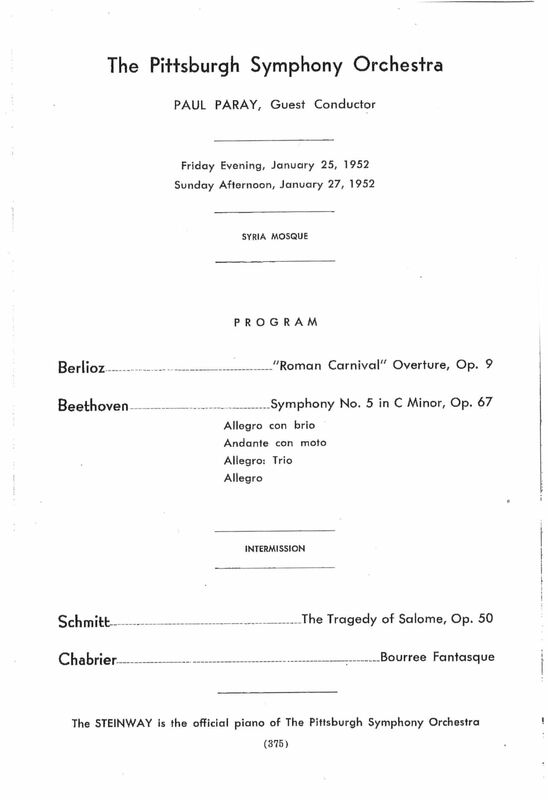 Later presentations of the piece included ones with the Orchestre Philharmonique de Monte-Carlo (which Paray took on a North American tour with the orchestra in March-April 1966), as well as a 1971 ORTF performance as part of that year’s “Festival de musique française” which was broadcast over Radio-France. That ORTF performance is available to hear today, and it reveals some subtle changes in the then-85-year-old Paray’s interpretation of the score as compared to his 1958 commercial recording. The lusty cheers of the audience at the conclusion of the piece offer further proof of the dynamism that the conductor always brought to this music. Another Schmitt über-enthusiast, Orchestre Symphonique de Québec music director Fabien Gabel, spoke in an interview several years ago about how Paray’s Mercury recording was in his highly musical family’s extensive record collection when he was a child (Gabel’s father played trumpet at the Paris Opéra for nearly 40 years and his mother is a well-known harp player). The music had a big impact on Maestro Gabel then – and sparked a career-long interest in the composer as a result. 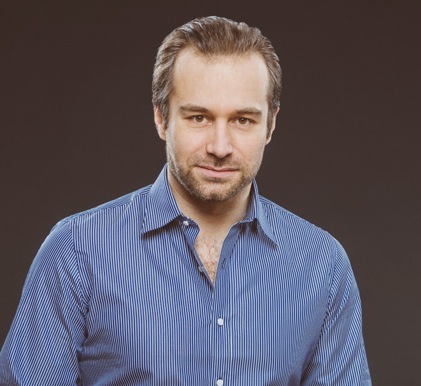 “While my entry into the fascinating musical universe of Florent Schmitt was through his Antony & Cleopatra – which I adore – I have always wanted to undertake his Tragedy of Salome, too. For that reason, I’m delighted to have the opportunity to perform and record it next season. 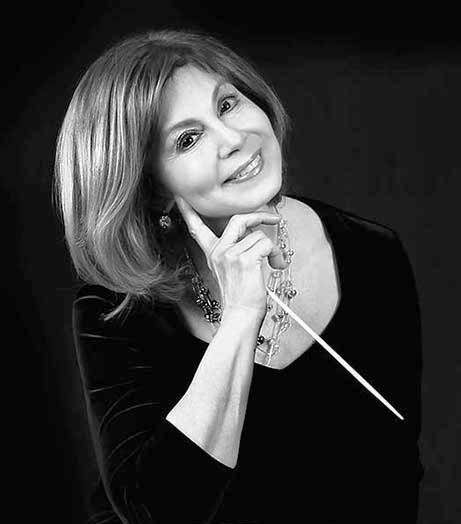 I’m quite sure that a goodly number of other conductors who are presenting La Tragédie de Salomé today – Kasuyoshi Akiyama, Alain Altinoglu, Lionel Bringuier, Sylvain Cambreling, Paul Daniel, Jonathan Darlington, Sascha Goetzel, Jacek Kaspszyk, Ira Levin, Thomas Loewenheim, Daniel Myssyk, John Neschling, Yannick Nézet-Séguin, Eckart Preu, Gottfried Rabl, Lan Shui, Marc Soustrot, Yan-Pascal Tortelier, Mario Venzago, Pascal Verrot and Ronald Zollman among them – have likewise found inspiration from Paul Paray’s vital and vibrant conception of this remarkable music. Plus, with the 150th anniversary of Florent Schmitt’s birth coming up in 2020, I have no doubt that even more conductors will see fit to study and program this extraordinary score for the benefit of music-lovers around the world. This entry was posted in Ballet, Classical Music, Composers, French Composers and tagged Desire Defauw, Detroit Symphony Orchestra, Dmitri Mitropoulos, Fabien Gabel, Florent Schmitt, Grand Prix du Disque, JoAnn Falletta, La Tragedie de Salome, Mercury Living Presence, Paul Paray, Sixten Ehrling, Stephane Deneve, Tragedy of Salome. Bookmark the permalink. « Four important compositions of Florent Schmitt to be featured in the upcoming 2018/19 concert season by orchestras in Bern, Buffalo, Malmö, Mexico City, Norfolk, Paris, Québec City, Warsaw and Washington.